It’s been a quiet few weeks for the Grange Pavilion garden, but we’re changing gear now preparing for the new season. We met last Sunday at the pavilion to carry out some tasks. 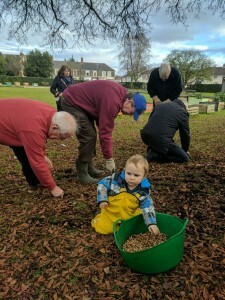 These included, amongst other things, weeding and general tidying up, preparing the ground, sowing poppy seeds and soil testing. We are also fortunate enough to have been donated two living Christmas trees by the Wales Millennium Centre (maybe you saw them outside the Centre over Christmas) which we planted in the garden! If you can make it down to help out, it would be great to see you. It doesn’t matter if you haven’t been before – we always welcome new faces. We also want to start planning what to grow this year. So please come with your ideas!